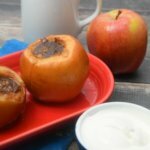 This Baked Apples in the Slow Cooker recipe is perfect for 4-6 apples in the slow cooker. Wash and core apples, but keep the bottoms. You can use a melon baller or paring knife to core the apples. Pare off a 1-inch strip of the skin around the top of the apples to prevent splitting. Mix the brown sugar, cinnamon, butter, and oats (or walnuts) together in a bowl. Fill each apple with the mixture. Place the apples in the slow cooker and add the apple juice around the bottom of the apples. Turn the slow cooker on high heat and cook for 2 1/2 to 3 hours until apples are soft when poked with a fork. Serve with ice cream and caramel sauce, whipped cream, or as is. If you need more apples, get medium-sized ones as large ones take up a lot of space.